Spaavdelingen på nabohotellet Puri Santari var heller ikke så verst. Men prøvde den ikke. Bali offers far more than night life and beaches. 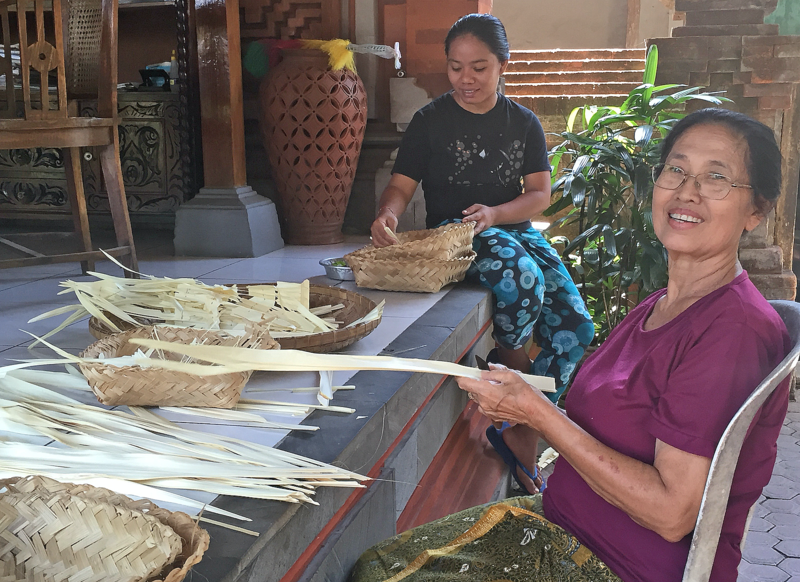 Here are six fBalinese experiences that should be on your holiday list. Bali is often reffered to as «The island of Gods». 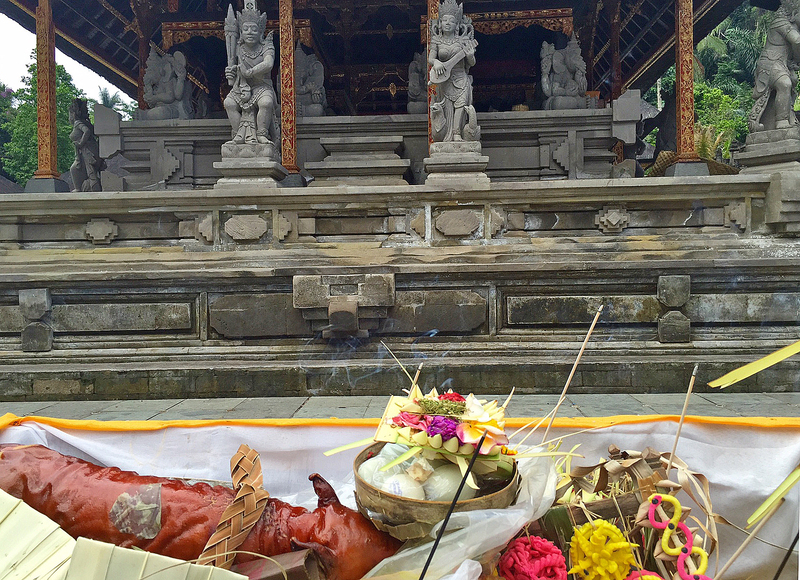 A visit to one of the larger temples is a must while in Bali. We chose the holy water temple Pura Tirta Empul, which was built over a thousand years ago. Here comes the Hindus to bathe and rinse in the holy spring water, which is said to have healing effects. According to Hindu tradition, every family also have their own temple in the garden, that is used for familial ceremonies and the daily sacrifices in the form of Canang sari; small straw baskets filled with flowers, incense and other goodies to the gods. Canng saries in fornt of the temple. Bali is a volcanic island, and several of the volcanoes are still active. Mt Agung is the island’s highest peak, rising 3031 meters above sea level, while the original larger but dilapidated volcano Batur today measures 1717 meters. Volcano Batur has had frequent eruptions in the last 200 years and had the last in 2000. 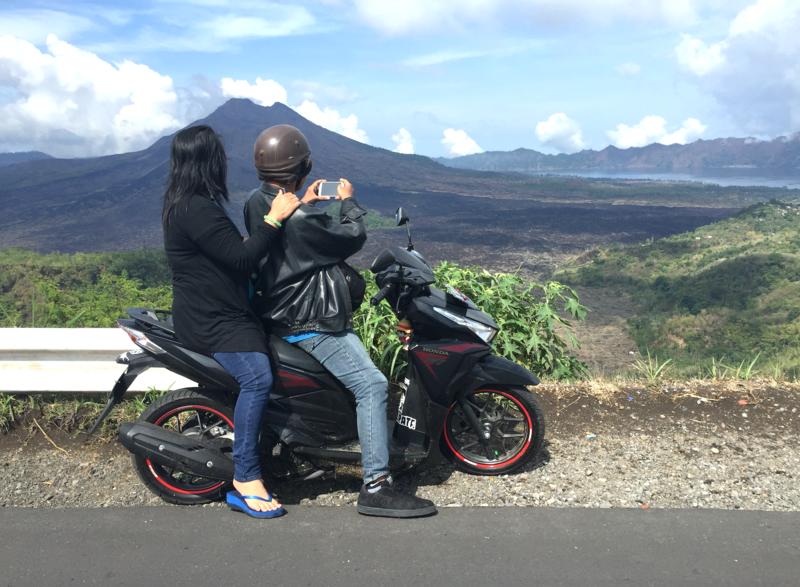 The dried lava river caused by the deadly outbreak in the 1960s can still be seen from the village of Kintamani, on the west side of the outer crater rim. Batur and the beautiful lake with the same name, is today one of the island’s popular tourist destinations. The active vulcan Mt. Batur measures 1717 meters. Visiting a rice terraces may sound boring, but the green rice fields in the hilly hinterland of Bali is really worth a sight. The geography of the island makes is necessary to plant on different levels or «the floors» to take optimal advantage of the field. 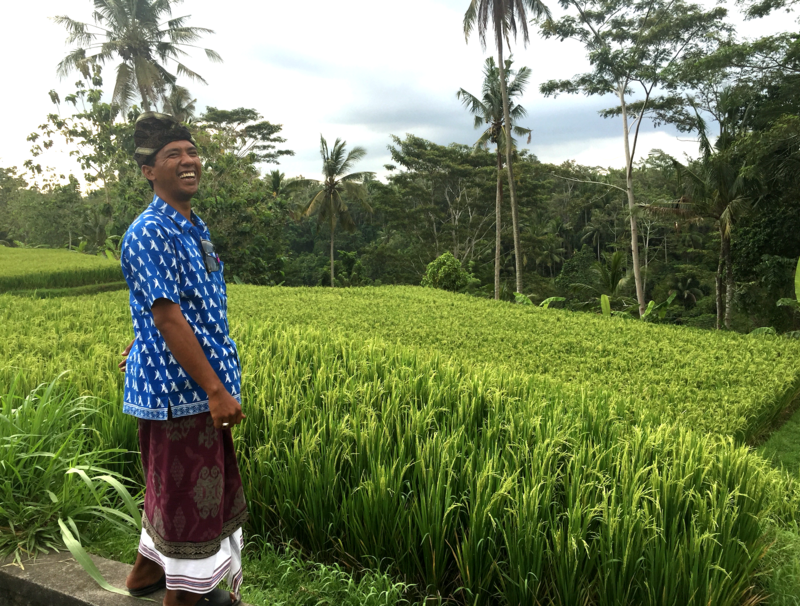 The lush fields look like patchwork quilts with varying ratios of water and green rice plants. Normally rice is harvested twice a year, and it is impressing to see the efforts these hardworking rice farmers put down, especially considering that most of the work is done by hand. Rice terasse in Ubud, with our guide Wayan in front. I always find it interesting to see how the locals live. 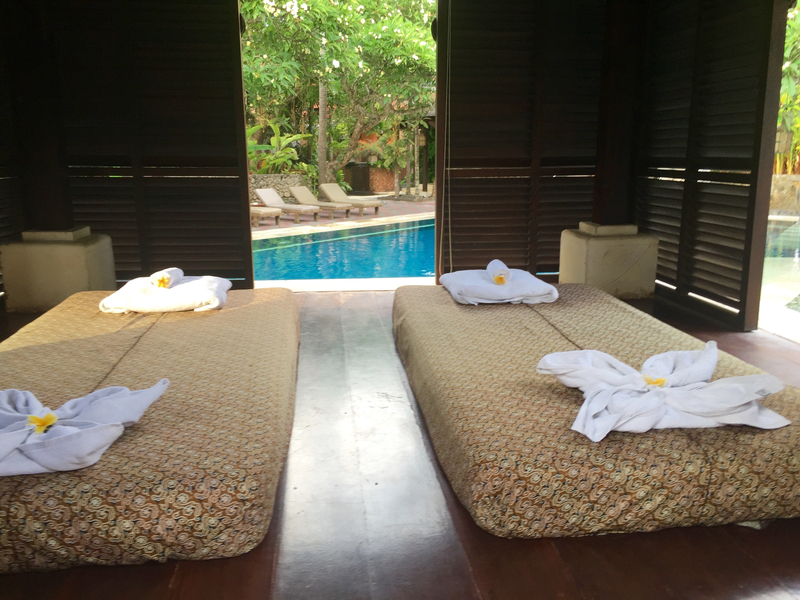 A visit to a traditional Balinese home is therefore a highlight in such foreign cultural surroundings as the Balinese and the Indonesian. Balinese architecture is influenced by both Hindu and pre-Hindu philosophy, as well as from neighbouring Java. There are strict rules for how a house should be built, and it is still common to turn to a local Hindu priest to get tips on how and when to build in accordance to the God´s will. In Bali, the social cohesion within the family and respect for all holy aspects is very strong. Traditional houses are built with social cohesion across generations, respect for the divine and other living creatures, including trees and plants. The word batik is an Indonesian / Malaysian term for a type of colour and patterning method of textiles. The method original came from neighbouring Java, but is currently used in many countries worldwide. You can buy batik at a cheap price on the markets and in souvernir shops everywhere on the island, but the quality varies as much as the price. I can happily admit that I do not see any difference between a medium quality and a good batik. 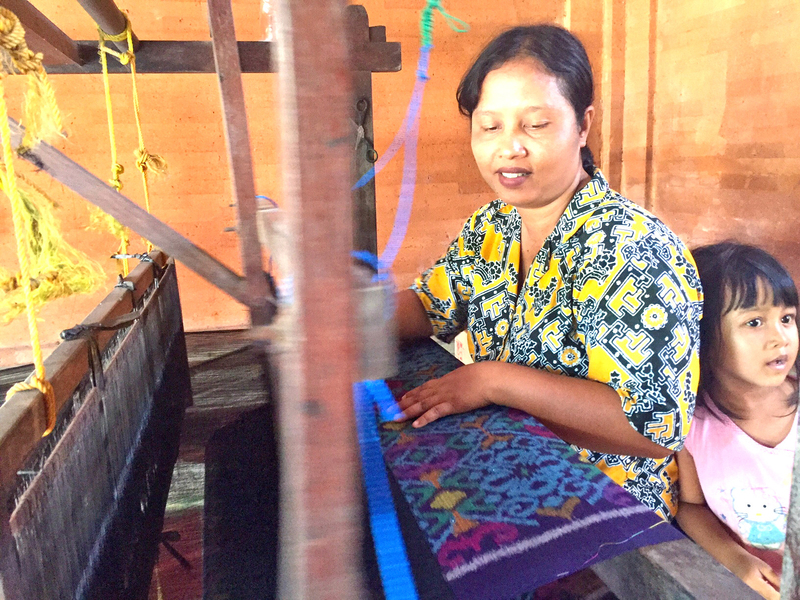 But a visit to a traditional batik workshop is nevertheless an exciting experience. We visited one of the many batik factories in Celuk area, where we were given a brief introduction to the whole process, from the textile being woved, waxed and dyed, and finally end up in the store. The people of South East Asia and the Pacific have for thousands of years used hollowed tree trunks as sailing canoes. The large canoes usually have an outrigger on each side, while the smaller ones only has on outrigger. These ancient vessels are relatively similar across the Pacific region, but come with different names depending on where you are. The Balinese jujunk has a so-called Latin sail, which looks like a triangular sails that is «upside down» on. The boats make good speed and going for a cruise is a great way to see the beach and the coast from the seaside. 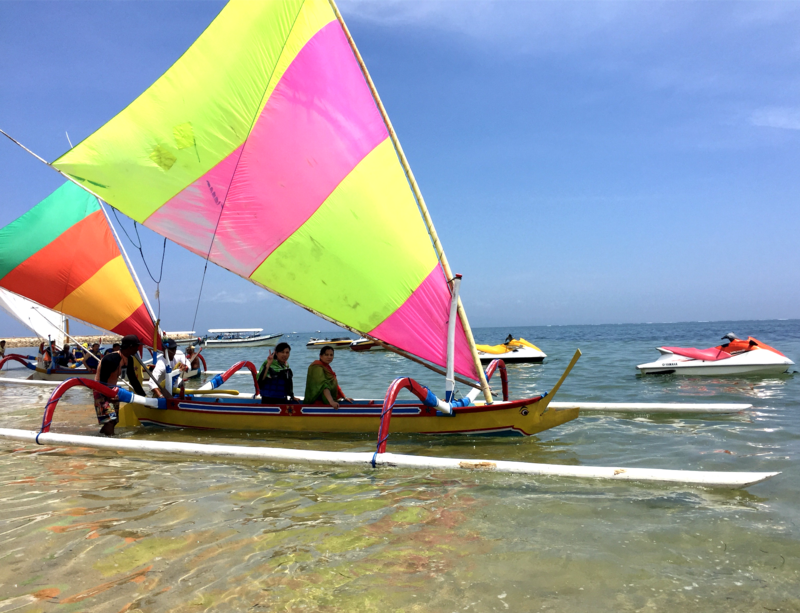 Colorful jukungs in Sanur beach. 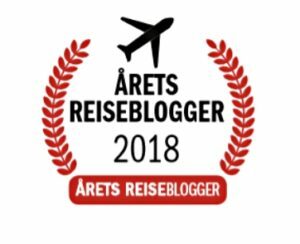 Det er alltid en god idé å reise til Bali. ;D Jeg er enig i alle disse grunnene! De to siste punktene har jeg ikke prøvd meg på, men de høres alle spennende ut.